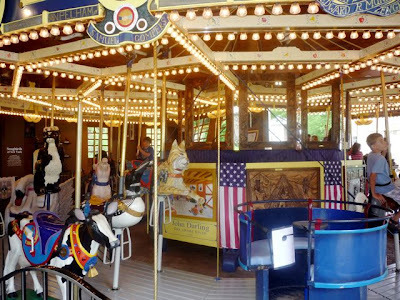 Article and photo (Empire State Carousel at The Farmers' Museum) by Eric H.
Cooperstown, N.Y., is best known as the home of the National Baseball Hall of Fame and Museum, but many visitors are surprised to find out that there are so many other attractions within this magical, beautiful region. At CooperstownForKids.com, we have written an article on many Cooperstown family attractions, (including recreational attractions) like the aforementioned National Baseball Hall of Fame and Museum,The Farmers' Museum, Fenimore Art Museum, Fly Creek Cider Mill and Orchard, Abner Doubleday Field, Clark Sports Center, Glimmerglass State Park, Cooperstown Fun Park, Doubleday Batting Range, and the Cooperstown and Charlotte Valley Railroad. Additionally, we feature a section on attractions close to Cooperstown, including the impressively educational and entertaining National Soccer Hall of Fame in Oneonta, N.Y.! We hope you enjoy these articles. We can't say enough good things about Cooperstown. The village and nine-mile long Otsego Lake are beautiful, and, as mentioned, there's certainly no shortage of things to do! The Fly Creek Cider Mill, in beautiful Fly Creek, NY (five minutes from Cooperstown), is famous for its delicious ciders, specialty foods and gifts, and wonderful outdoor lunch setting (with amazing pulled pork, chili, ice cream and homemade blueberry pie!). Much to our surprise, we found its homemade fudge to be, without a doubt, the best we have ever sampled! We've tasted them all through the years: chocolate, chocolate walnut, vanilla, peanut butter, chocolate peanut butter, rocky road, amaretto, mocha latte, maple nut, chewy praline, penuchi, pistachio and and out all-time favorite, creamsicle. 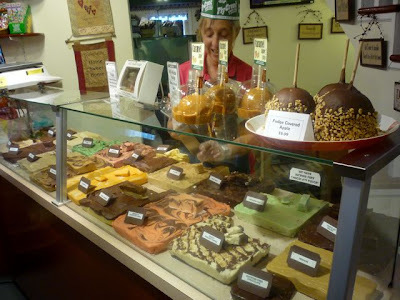 Please don't leave the Cooperstown area without visiting the Fly Creek Cider Mill and its delicious fudge! Sometimes, dining on Main St. during the summer in Cooperstown, NY, brings elevated prices and crowds that call for finding a place to eat off the beaten track. The Depot Deli is just that place, just a few minute's walk from the downtown -- although feeling like miles away. Spotlessly clean and with very friendly service, the Depot Deli features a wide variety of breakfast and lunch items, perfect for the family. It's not overly expensive, which is also a benefit for the family on vacation. Locals we've talked with acknowledge that this is a great dining option in Cooperstown. We're sure vacationers will find the same experience. We strongly suggest trying the Deport Deli out. It's a nice walk there, you'll be greeted more warmly than some of those downtown places, and the food is just as good if not better than other area restaurants serving breakfast and lunch. We loved the turkey with pesto and the tasty ham and cheese sandwiches. 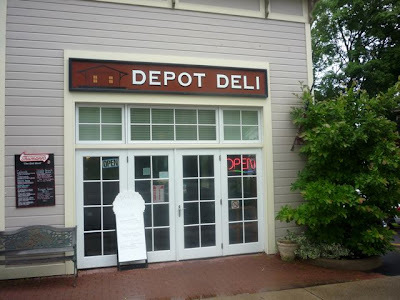 Nothing fancy, but the Depot Deli is terrific at making a very good sandwich -- and with ample portions. What a great find! We just returned from a wonderful stay at the Cooperstown Bed and Breakfast at 88 Chestnut St. in Cooperstown, N.Y. It's simply one of those places that we look forward to staying months before the trip. And once we leave, we start planning for the next visit. Family-friendly, quaint, charming, wonderful hearty breakfasts, easily walkable to Main St. and the myriad attractions (like the National Baseball Hall of Fame and Museum) and with the nicest B&B owners on earth -- Linda and John Smirk -- what's not to like? We can hardly wait to return to this beautiful 1902 Victorian that makes us so happy to be in Cooperstown, and with such special people like Linda and John! 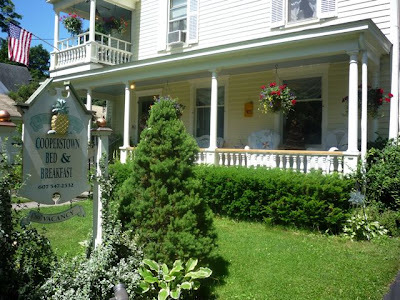 We recommend visiting the Cooperstown B&B Web Site for more information. While shopping a few years back at the interesting and ultimately wonderful Riverwood at 88 Main St. in Cooperstown, N.Y., we came across the Oneonta, N.Y.-based T.S. Pink line of soaps. Immediately falling in love with these unique soaps, we now make sure to purchase some more every time we visit Cooperstown. Colorful, natural and full of incredibly wonderful aromas, these rock-shaped soaps are infused with herbs, oils, and other wholesome ingredients that definitely go beyond your standard "natural" soap. The T.S. Pink soap-rocks clean very well, last a long time and, quite frankly, don't look like any other soap on the market. Next time you're in Cooperstown, definitely check out the Riverwood (selling crafts and other true works of art by local artists and artisans, Brighton purses and accessories, books, jewelry, leather goods, games and toys, etc.) and the T.S. Pink soaps they carry! You can also check out the T.S. Pink soap line here. Editor's note: We have no vested interested in this soap line, so the info you read here is strictly from a personal experience. Plus, we like to smell good! What would a summer vacation be like without a place to swim? 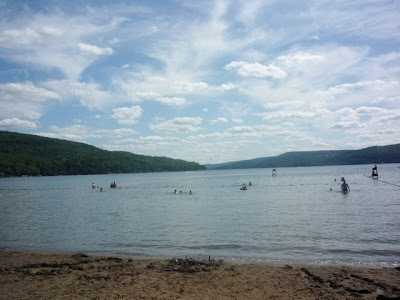 Fortunately, the Cooperstown, N.Y., area offers several lake beaches with Glimmerglass State Park at the forefront of idyllic places to swim. With plenty of sand and some of the cleanest lake beach water we've ever experienced, the beach at Glimmerglass State Park is an experience you won't want to miss. The beach is part of the beautiful, nine-mile long Otsego Lake -- everywhere you look is, quite simply, memorable. The swimming area is ideal with not much of a drop off, all the way out to the first set of ropes. The lovely mountains and hills add scenic splendor, the air is most likely fresher than where you live, and the open green land to have a cookout (along with some beautiful hiking trails) or toss a ball around helps make the beach a staple of locals and summer vacationers. We recommend checking out the New York State Parks Web Page for more information. Many visitors to Cooperstown, N.Y., aren't aware that there's a beautiful park just a few minute's walk from Main Street! 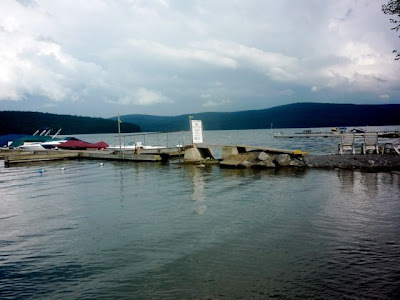 Whether on a sunny summer day or a cool night with dramatic sunsets, Lakefront Park affords beautiful views of magnificent Otsego Lake, perfectly framed by pleasantly scenic rolling hills. With a sprawling, lush green lawn, gazebo, marina with boatyard and a small lighthouse, and boardwalk with wonderful landscaped gardens, we embrace Lakefront Park as a "must-see" when visiting Cooperstown. From Main Street, take Lower Pioneer Street (at the intersection in the heart of the Village near the Tunnicliff Inn) to this special Cooperstown destination. It's great for a picnic, weekly Tuesday night concert (from July through Aug. 25 at 7 p.m.), or just to relax and take in one of Upstate New York's most scenic lakes! If you are planning on visiting the National Baseball Hall of Fame and Museum in Cooperstown, N.Y., I strongly recommend logging onto to the "Upcoming Events" page. There's a lot of wonderful things going on at the Hall of Fame, including the upcoming 2009 Baseball Hall of Fame Induction Ceremony Weekend featuring baseball greats Rickey Henderson, Jim Rice and Joe Gordon on July 26th at 1:30 at the Clark Sports Center on Susquehanna Ave. in Cooperstown. Of course, we recommend you taking a look at the entire National Baseball Hall of Fame and Museum Web Site for additional information on visiting this truly remarkable destination! 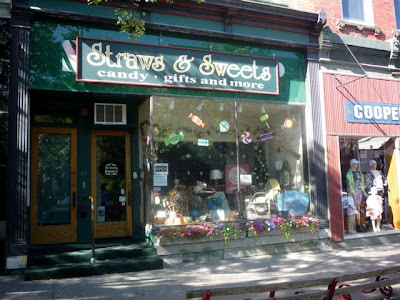 Straws and Sweets has made its popular candy and gift shopping experience that much sweeter by moving, not too long ago, from 70 Main St., Cooperstown, N.Y., to a new location virtually across the street at 81 Main St. For those of you who know Cooperstown well, this is the former site of the National Pastime baseball collectibles store. The new, bigger location means more sweets, more gifts, a nicer layout and ultimately a more visible location in the heart of this idyllic, quaint village. The store looks great! By the way, when visiting Straws and Sweets, be sure to buy some cookies from the Cooperstown Cookie Company -- locally made, all-natural cookies with a baseball theme! This is a quality product and it feels good to support local businesses. Cooperstown, N.Y., has so many wonderful attractions for kids, but let's not forget the myriad things to do for the family not too far outside the village. One such destination is Glen Brook Farm, about a half-hour from Cooperstown in Oneonta, N.Y. Glen Brook Farm features summer workshops where kids can "interact with animals, work in the garden or create in small groups led by artists, who guide them in drawing, painting, sculpture and other mediums, all while working in outdoor studios," according to its brochure. The emphasis is on education and sustainability, inspiring the values of caring, responsibility, honesty and good stewardship of the land. Wow, this beats playing with a video game any day! We recommend checking out some of the summer activities at Glen Brook. Opening July 4th with lines quickly assembling out the door, New York Pizzeria, at 75 Chestnut St., indeed experienced a welcoming debut. Clean, personable and with some of the best made-from-scratch Italian-style pizza we've sampled anywhere, we look forward to eating at New York Pizzeria during our future vacations. The homemade sauce and cheese blend, as well as the truly fresh eggplant and red pepper toppings, were absolutely phenomenal -- and quite noteworthy, given we are from the Boston area where some of the most renowned pizza places reside (Pizzeria Regina, Santarpio's, etc.). Take-out seemed to be the preferred mode when we visited, but New York Pizzeria (with its flagship restaurant in Richfield Springs, N.Y.) also features very pleasant, nicely renovated dining rooms with a moderate amount of seating. It's nice that Cooperstown finally has a pizza place that is running on all dining cylinders! Mom will Love the Shopping Opportunities in Cooperstown, NY! If Mom has any trepidation about your Cooperstown, NY, vacation being entirely comprised of baseball-related activities, have no fear. Cooperstown has many wonderful cultural vacation attractions like the Fenimore Art Museum, Glimmerglass Opera, Cooperstown Art Association, and the Cooperstown Concert Series, but it is also a place that features some great shopping on Main Street. We recently showcased an article on Main Street shopping in Cooperstown, focusing on the shops that Mom might enjoy in this quaint downtown district. We encourage you to read this article, as well as the myriad attractions and recreational activities that will appeal to all family members. You can read the "Cooperstown Main Street shopping for moms" article here.